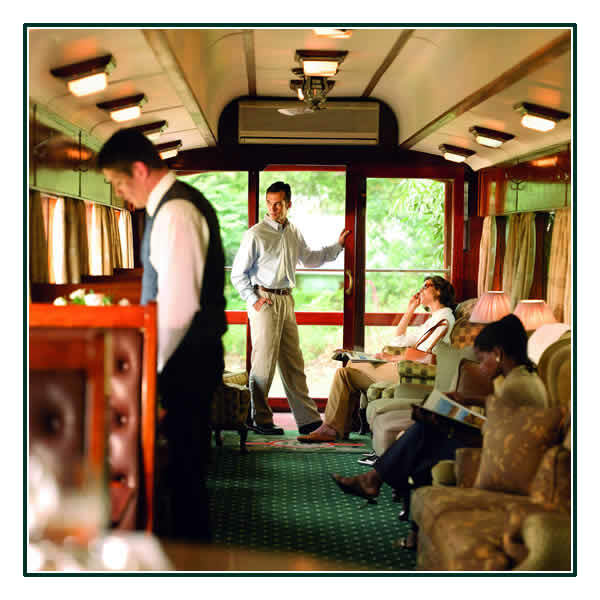 A Rovos Rail journey encapsulates the romance and atmosphere of a bygone age. Experience the majesty of Africa whilst travelling in luxurious surroundings. Since it was established in 1989, Rovos Rail has earned an international reputation for its truly world class travel experiences. Step aboard the wood panelled coaches - classics remodelled and refurbished to mint condition - and enjoy fine cuisine in five-star luxury as some of the most varied scenery imaginable unfolds beyond the windows. Recapture the romance and atmosphere of a bygone era, when privileged travellers experienced the magic and mystery of Africa in a relaxed and elegant fashion. The trains - which may be hauled by diesel or electric locomotives at various stages of the journey - carry a maximum of 72 passengers in 36 superbly appointed suites. Service is friendly and discreet. Each train has one or two lounge cars. Permission was sought and granted by South African Railways to run the Observation Cars at the back of the Trains, enabling enlargement of the windows and the construction of unique open-air balconies. These classic coaches are the perfect place to enjoy a leisurely drink or a cup of tea, get to know the friendly hostesses and fellow travellers and read up more about the route and the many fascinating attractions. The lounge car and on board gift shop is in the centre of the train. The epitome of luxury, with handsome wood panelling and period Edwardian features, the air-conditioned suites accommodate two people offering the option of twin or spacious double beds. All are equipped with a writing surface and, for valuables, a personal safe. There is also a bar fridge filled with beverages of the passengers’ choice and room service is available 24 hours a day. In the en suite bathrooms original fittings combine with the modern technology of hot showers, hair dryers and shaver plugs. The four Royal Suites (16sqm) each have their own private lounge area and feature a full en-suite bathroom with shower and Victorian bath. The Deluxe Suites (11sqm) each have a lounge area and en-suite bathroom with shower. The use of traditional furnishings and period decor, with top-class craftsmanship evident in fine wood panelling, has ensured an atmosphere of elegance and grandeur in the Dining, Lounge and Observation cars. Each one of these Rovos Rail carriages, from kitchen cars to sleeper coaches and guards vans, has its own story. Each one has a proud history and has been meticulously restored from a derelict state. For example, No 195 Shangani, which was built in 1924, was found parked in a siding in Alberton and acquired by Rovos Rail in 1986. Three of the magnificent teak pillars had been removed and her severely dilapidated condition required 18 months of painstaking restoration. The pillars were faithfully recreated, restoring the Victorian atmosphere. Shangani ran on the inaugural trip in April 1989. Each of the trains has two 42-seater dining cars to accommodate the maximum complement of 72 passengers in total comfort at one sitting. 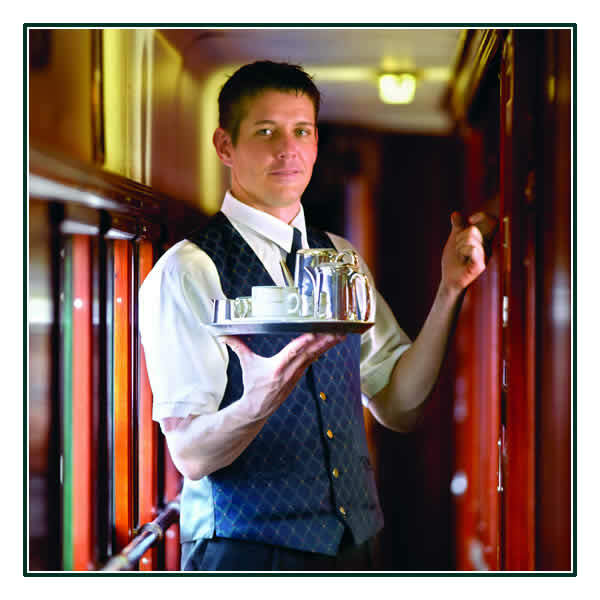 One of the dining cars is a refurbished Edwardian pillared dining car dating from the 1920s, while the other is a classic luxury dining car of 1936 vintage. 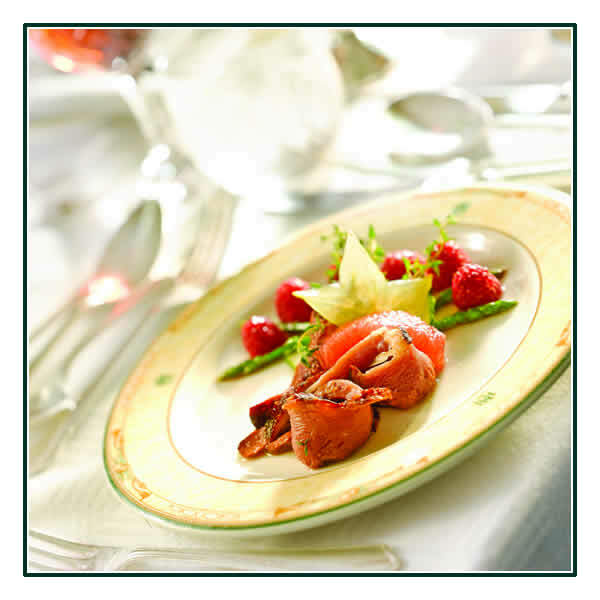 The latter is a favourite venue for lunch and offers a superb view from the larger picture windows.